Zero - nothing, clean slate, neither positive nor negative. Picture - hobo stick, free from worldly concerns, care-free posture, relaxed, basking in the sun, on a dangerous cliff edge, canine companion, fragrant flower in hand, dressed cheerfully and for adventure. 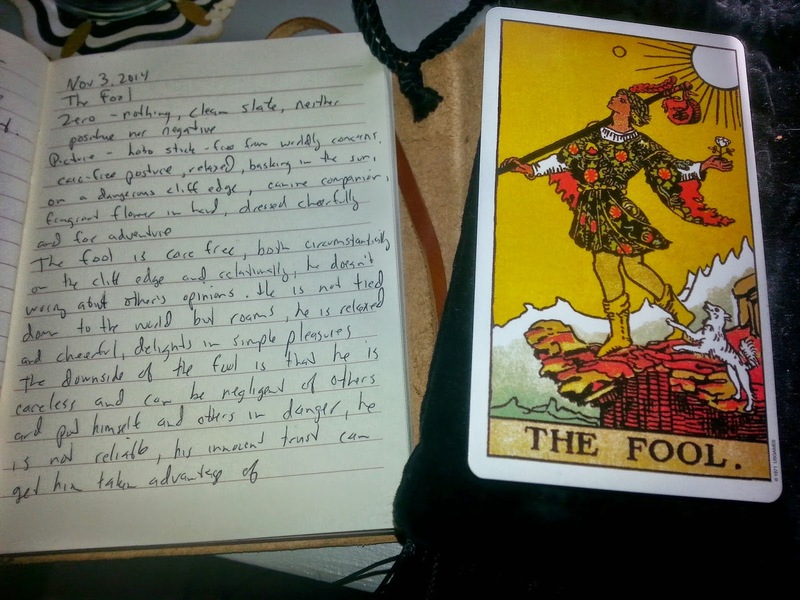 Divinatory meaning - The Fool is care-free, both circumstantially on the cliff edge and relationally, he doesn't worry about others' opinions. He is not tied down to the world but roams. He is relaxed and cheerful, delights in simple pleasures. The downside of the fool is that he is careless and can be negligent of others and put himself and others in danger. He is not reliable. His innocent trust can get him taken advantage of. and get things done, without suffering the pitfalls of Folly? How to take hold of the energy of The Fool in day-to-day life full of responsibilities? In the gaps? In the space between the moments? This will be my meditation in the near future. Add lightness, joy to moments, sing, dance, smile, encourage, be a goof. Don't worry about the opinions of others. Balance the wisdom of The High Priestess with the care-free energy of The Fool.